If you haven't already heard, video content is an important consideration for all brands on social. Video is currently the most engaging form of digital content, in general terms, and predictions are that consumer appetite for video will only increase - according to Cisco, 75% of the world's mobile data traffic will be video by 2020. The rise in video consumption is particularly evident across Facebook's apps - as per to the latest data from the social giant, daily watch time for Facebook Live broadcasts has quadrupled in the last year, while time spent watching video on Instagram has increased by 80% in the same period. On top of this, Instagram reports that the number of videos posted per day on the platform has continued to increase by 4X year-on-year, and that trend looks set to continue as Instagram Stories continues to gain traction. Again, if you haven't considered where, or if, video fits into your context mix, it's worth doing so. To provide even more context for consideration, Facebook's published a new research report which looks at overall video consumption trends, and what publishers can do to maximize their video performance. To gather more insights into video consumption behaviors, Facebook commissioned a study of 1,500 people aged 18-64 in the US and Canada. Their first major finding was that the video trend only looks set to increase - 45% of those surveyed indicated that they expect to consume even more video on their smartphones in the future, with Instagrammers the most likely to watch more. In fact, 60% of Instagrammers surveyed said that they believe their consumption of video on Instagram has increased significantly in the last two years. Interestingly, Facebook has also compared that data to TV viewing - 33% of TV viewers surveyed said that they believe their TV viewing has increased in the same period. If you're wondering why social networks are all looking to produce their own TV-like content, this is the key trend they're seeking to tap into - more people are consuming more video on mobile, or via social platforms anyway. If Facebook can effectively harness this, they can tap into the $78 billion TV ad market. In terms of why consumers are consuming more mobile video, respondents said that mobile videos are convenient: "they tend to be short and can easily be viewed anytime, anywhere." And while that ease of use, the ability to watch video anyplace and anytime, is a key trend, you can see from the data that the majority of users identify the home as where they're consuming such video anyway, further underlining Facebook's advances towards TV-like content. But there's more to digital video consumption than just ease of use. Facebook's research also found that those who view video online also do so because there's a greater sense of communal sharing and engagement with friends. 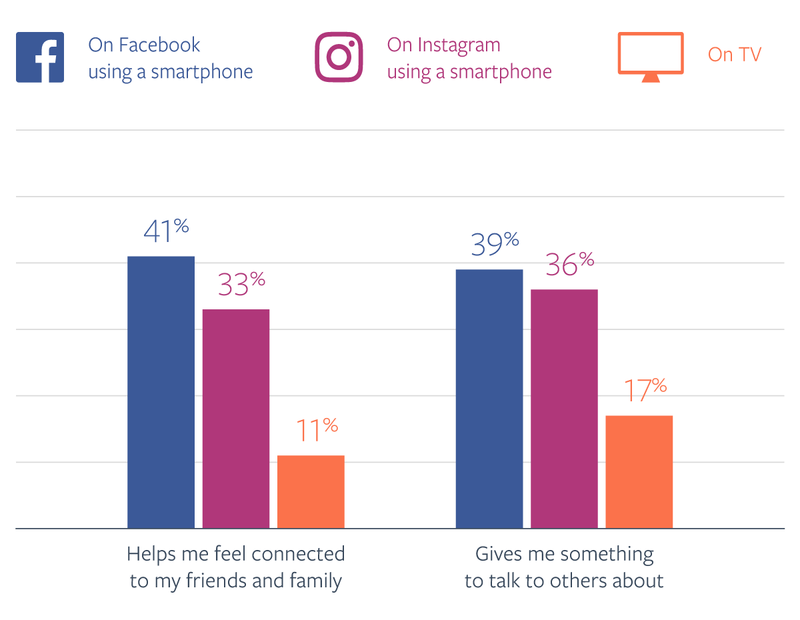 "Our survey showed that people are also drawn to mobile video on Facebook and Instagram because compared with traditional TV, it's 2.9x more likely to help them feel connected to friends and family and 1.9x more likely to give them something to talk about. In other words, it makes them feel part of an engaged community." This is the more unique use case, as opposed to traditional TV, which gives Facebook, and other online video providers, an advantage. It's why Twitter sees opportunity in combining real-time tweets and live-streams in one space, why YouTube recently launched a new app focused on communal video viewing. The rise of social media has lead to a greater desire for interaction while viewing, to take part in the surrounding conversation and get a sense for what others think about the content. This is also a key benefit of live-streaming, the capacity to comment and interact in real-time - while we haven't yet seen live-stream content move into the mainstream, the opportunity is there to generate real engagement and connection, which is, again, why Facebook is putting greater emphasis on the offering. The research also showed that social video has a greater emotional pull than traditional TV - most likely because of that increased social interaction around such content. 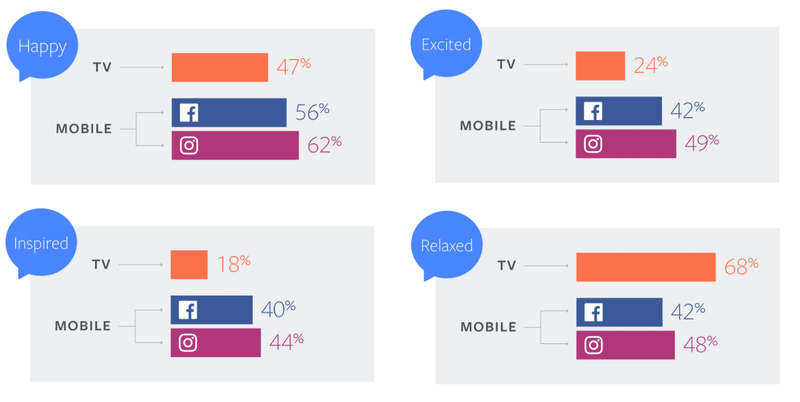 "Those surveyed were also 1.8x more likely to say they feel inspired by mobile video on Facebook and Instagram than TV, and 1.5x more likely to say they feel excited by mobile video on Facebook and Instagram than TV." As you can see, TV wins out in the relaxation stakes, as it's a more passive viewing experience, but the other elements would suggest that social video is a far more effective medium for engagement, and thus, delivering marketing messages. That's not definitive, of course, traditional TV still offers far more wide-ranging reach, but the data does indicate some relevant trends to consider. 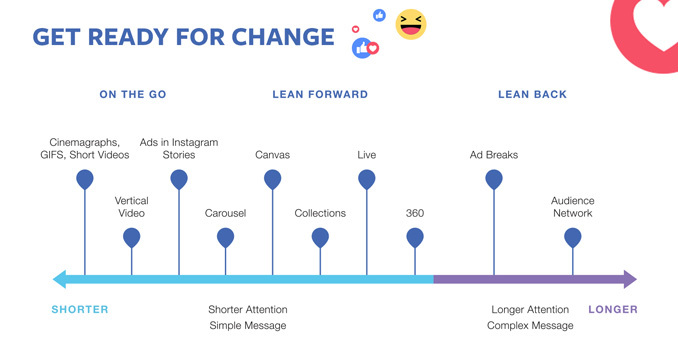 In terms of more passive viewing, Facebook calls these 'Lean Back' experiences - you can see on this chart where they fit into the Facebook ads mix. As Facebook moves more into long-form video content, they'll be looking to introduce more ad breaks, whereas the shorter-form video options already have a range of options in this regard. 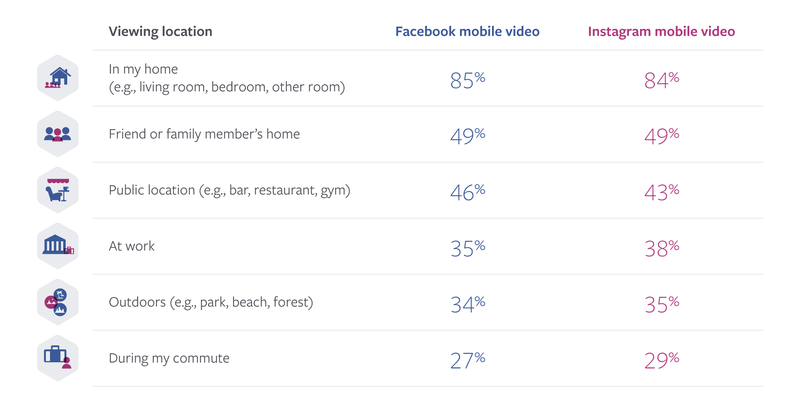 As Facebook advances their video efforts, you can expect to see more options in the latter segment. In a separate report, Facebook advises that mobile consumption trends lean towards shorter, more precise messaging, so publishers should look to deliver their promotional messages within 15 seconds. And while Facebook is currently migrating users to sound on by default, they advise that publishers should create content that works with sound off also. And one other, maybe more controversial, suggestion - Facebook says creators should look to provide video in vertical format. "People watch videos casually and on the fly - and they rarely turn their phones sideways to do it." Video experts tend to dislike vertical video because it reduces the content quality, but the numbers don't lie. It's a case-by-case proposition, but it is worth considering how people are viewing - and whether they'll bother turning their screen to get the full experience. As noted in the research, mobile video gives people a greater sense of connection and community - so giving them something to discuss with their connections can be a great strategy. "People turn to mobile video on Facebook and Instagram because the content is often sparks conversations both on and off the platform. Make your mobile videos striking enough for people to share, when they're on mobile during a break from work or chatting #IRL at a summer rooftop party." And this final point is key to Facebook's wider video push - through the platform's advanced targeting, you can deliver your message to the right people at the right time. This is a significant advance on the current TV ad options - rather than looking to reach the widest possible audience and hoping for response, Facebook advertising enables you to hone in on more specific audience - which, if Facebook can move into longer form TV content, and become a genuine TV alternative, will give them a significant advantage in the advertising stakes. If successful, TV advertising, which is still one of the most effective ways to share your message, will become far more affordable, and more effective. Where still a long way off that next level, of Facebook taking over TV's space as the key entertainment platform. But the data shows that's where they're headed. These are key trends that should not be overlooked.